Art is an essential part of who I am. I have known this for such a long time. I’m finally at a point in my life where I feel expressing myself through my art is exactly what I should be doing. I have struggled with my inner demons lacking the confidence or conviction to follow this path and continually comparing my own abilities to those of others. Finally, I’m just happy to do what I do and if others like, or love it then that makes me so happy. The common thread in my art is my love of colour, in particular, my love affair with blue. I have an affinity with circles, there is no beginning or end, they are eternal and they always seem to crop up in my more abstract work. I have an absolute passion for printmaking, each print is unique with its own character. I adore that a series of prints although cohesive in looks each posses its own character, it’s an individual, a one of a kind. I have been so lucky to travel abroad, living in some incredible places and discovering my passion for art all over again. 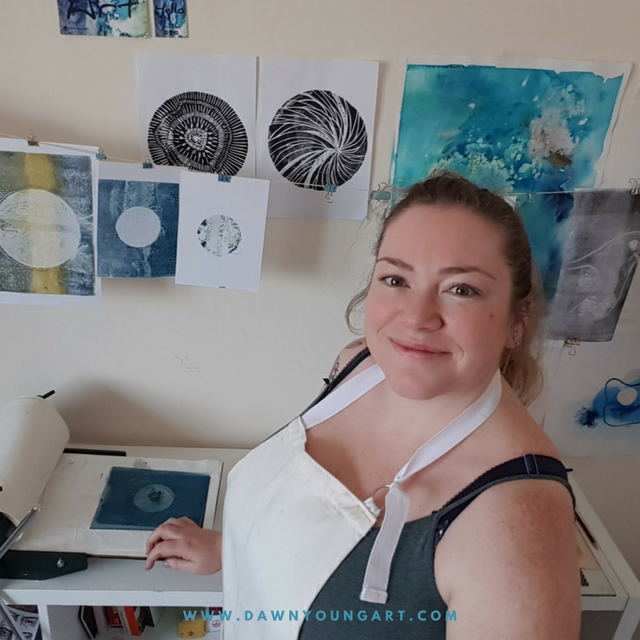 While my children were at school I took time to learn new skills, currently I'm studying towards a BA in fine art, with a focus on printmaking. I fell in love with the artform as soon as I pulled my very first print and have been hooked ever since. I now have a small art studio with a small printing press, a place where I can escape and create the art I love. I have different sides to my persona the free, wandering spirit who adores colour, curves and soft shapes and the methodical, meticulous side, more rigid and utterly obsessed with blue, in all it's hues.